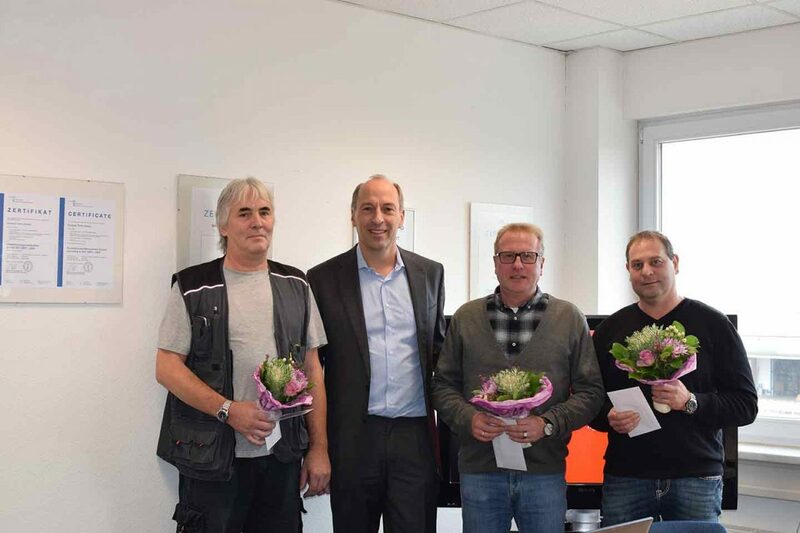 For two clever ideas with a great savings potential in the high 5-figure Euro area, four friedola®TECH employees at the Leinefelde plant were awarded with a 10000 € bonus. With their idea to process the occuring purging lumps and offer them on the market, Norbert Gunkel and Michael Grede could score a big coup! Instead of disposal costs, we now have increased sales. The proposal of Thomas Genzel and Siegfried Lath refers to the cooling unit of our COMAC maschine. It´s efficiency and power consumption could be greatly improved with the idea to build sort of a chimney made of Con-Pearl® lightweight boards on the top of the maschine. Without this construction, the hot air could not be diverted from the engine. The hot air was sucked back into the machine, causing feedback. Thank you for your involvement and dedication. We are looking forward to you further participation in our suggestion scheme!